In 1933 George Antheil returned to America from Europe. Three years later he settled in Hollywood, where he began to compose film music. This change in direction from the ‘Bad Boy of Music’ image of the Ballet Mécanique and Sonata Sauvage, works that had been greeted by uproar in the 1920s, is noticeably apparent in his later style. His music became more tonal and melody-based. The three works presented here unveil this more neo-classical and neo-romantic idiom. At the time the Symphony No. 4 '1942' was written, Antheil was working as a war correspondent for the Los Angeles Daily News. The escalating global conflicts were to ignite his imagination. The resultant Symphony was premiered in a radio broadcast in February 1944 by Leopold Stokowski and the NBC Symphony Orchestra. A year later, it was given in a public concert in Washington by the National Symphony Orchestra and Hans Kinder. I've never heard the work before, but if I'd been subjected to a blind tasting, my first thoughts would have been Shostakovich's 'Leningrad' Symphony and the similarities. The portentous opening movement is underpinned by tension and unease, and the march-like rhythms confer a militaristic bearing. I caught brief snatches of Sibelius and Ives along the way. An intensely lyrical second movement pays tribute to the many victims of Nazi atrocities. This is followed by a Scherzo, which the composer described as 'a brutal joke, the joke of war'. The harsh struggles of the preceding movements are assuaged somewhat in the more upbeat finale, triumphant, with the end of war in sight. Working to a commission by Eugene Ormandy, the Symphony No. 5 couldn't be more different, as its title 'Joyous' suggests. The doom-laden disposition of the third and fourth symphonies here gives way to a more optimistic and celebratory vein. Antheil finally leaves behind all vestiges of 'modernism' for a work strongly tonal and imbued with memorable melody. Gone are the cyclical underpinnings, traded for a three movement work, where each has an independent life of its own. The first movement struck me as very American sounding in its bustling vivacity. Prokofiev replaces Shostakovich in the passenger seat. By contrast, the slow movement is rather plaintive in mood. Youthful optimism and a playful carnival atmosphere characterize the finale; its infectious energy radiates euphoria and elation. Ormandy premiered the Symphony with the Philadelphia Orchestra in December 1948. The short orchestral piece Over the Plains is here receiving its first recording. It dates from 1945, and draws its inspiration from a trip the composer and his wife made to the Texas plains in the 1930s. 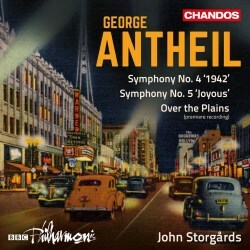 The pioneering spirit, unbounded optimism and cheerfulness exhibited by the locals impressed Antheil, and these endearing qualities found their way into the score. The music struts along with a confident spring its step. Brilliantly orchestrated, it shows the capable hand of a composer experienced in film scores, especially in the references to ‘cowboy’ music. Dedicated to his wife, Boski Markus, it had its first performance in 1945 with the Dallas Symphony Orchestra under Antal Doráti. Storgårds’ finely chiselled performances make a strong case for this imaginative and colourfully scored music. The BBC Philharmonic are ideally balanced in the mix. I hope this is the start of an Antheil orchestral cycle. If it is, then I can’t wait for the next instalment.